Wood is beautiful. Trees work hard to make it. I try not to interfere with the natural beauty of wood. There is nothing I could carve, stain, paint, or inlay that would look better than the wood itself. Adding a touch of color to some coats of the finish. A combination of both methods. In the photograph above is a soundboard made from an excellent piece of spruce; light, stiff, and plenty of medullary rays. The photograph shows the soundboard after several minutes of applying a water based stain. After preparing the wood for finishing I wipe it down with a wet rag and once dry do the final sanding and burnishing. This helps prevent the grain from rising as I apply the water based stain. I wipe the soundboard down again with water and rub the stain into the dampened wood with a rag. 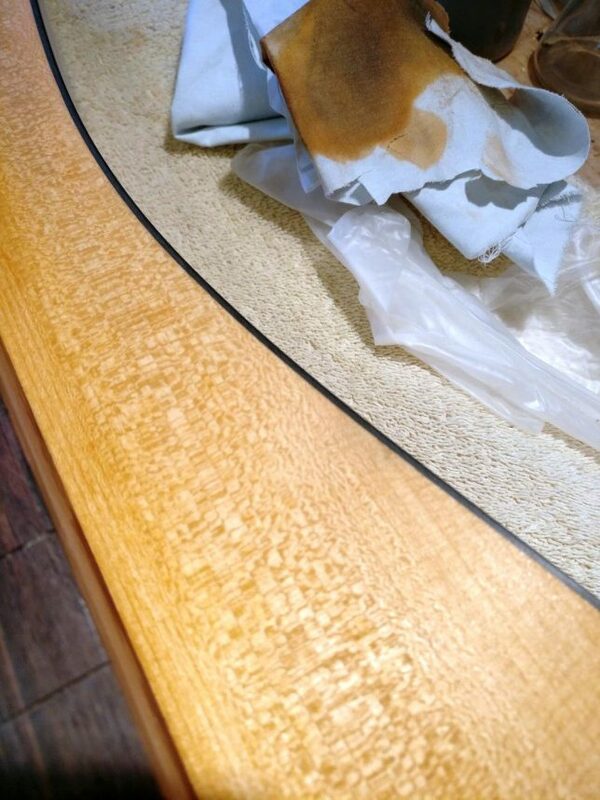 By moistening the wood the stain is less likely to blotch and it is easier to blend the stain into the wood. After the wood has fully dried I’ll decide if the color is pleasing or if I will add or remove stain to get the desired look. Since I’m using water based stain I can rub the surface with a wet rag to blend and remove color if need be. This is a bit like finger-painting! After arriving at happiness with the color of the stained wood I’ll decide if I want to add any color to the finish; I figure things like that as I go. Yes, another adventure in dulcimer making! There are halls in heaven that open their gates only to the voice of song.